Natalie Chambers is a Licensed Mental Health Counselor in the state of Washington. Natalie approaches counseling holistically, addressing the whole person through physical, mental, and spiritual healing. She strives to provide a nonjudgmental, warm, and empathetic atmosphere where clients will feel cared for, accepted, challenged, and empowered. She recognizes the amount of strength it takes to commit to counseling and considers it an honor to walk with her clients. 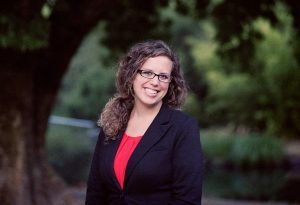 Natalie received her Master of Arts in Counseling from Multnomah University and her bachelor’s degrees in political science, and journalism and communication, with an emphasis in public relations from the University of Oregon. Natalie has worked in community mental health and outpatient counseling centers. She uses a variety of techniques in therapy, including research-proven cognitive-behavioral therapy. Her approach is tailored to each client individually as she recognizes that each person’s experiences are uniquely theirs. Born and raised in Portland, Oregon, Natalie loves The Northwest and all its beauty. In her free time, you will find her ducking the rain at her favorite coffee shops or exploring the vast number of running and hiking trails in the area.